July 26, 2018, 9:51 a.m. The rankings are based on YouGov BrandIndex data from across the world. BrandIndex operates in 37 countries across the globe, covering markets in North America, South America, Europe, Africa, Asia and Australasia. For the list YouGov used data from 26 countries – data from markets that cover three sectors or fewer were not counted in the global top ten. The rankings use the Index score which assesses overall brand health. It takes into account perceptions of a brand’s quality, value, impression, satisfaction, reputation and whether consumers would recommend the brand to others. Digital brands dominate this global ranking and with good reason. By their very nature the likes of Google, YouTube and WhatsApp are available in most places on earth to anyone with internet access. However, while many of the top five have only been around for the last decade or two, classic brands that have been around a good while longer also make the list. IKEA, Colgate, Uniqlo, and Lego, all still connect with the public and as a result have very positive brand health. 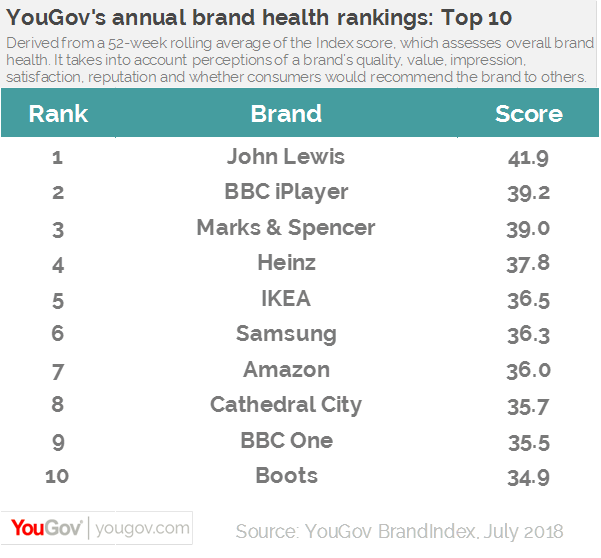 YouGov has also released its UK brand health rankings. The list is characterised by the presence of brands that have been in the public consciousness for a long time. Traditional high-street favourites John Lewis and Marks & Spencer are first and third respectively while BBC-related brands – iPlayer and BBC One – are in second and ninth positions. Meanwhile Heinz makes an appearance in fourth place. The rankings are drawn from over 1.46 million interviews in Britain conducted between July 2017 and June 2018. Each day consumers are asked their view on 1,384 brands in the UK, which allows YouGov to build a picture of how different brands are perceived by the general public, their own consumers, people considering using them, and their competitors’ customers. 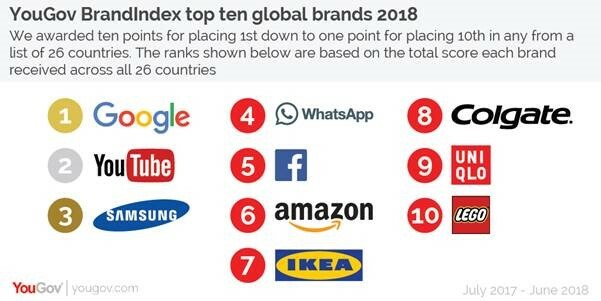 Two brands from the global rankings are also in the UK list, with Samsung in sixth and Amazon in seventh. Pharmacy chain Boots rounds off the top ten. 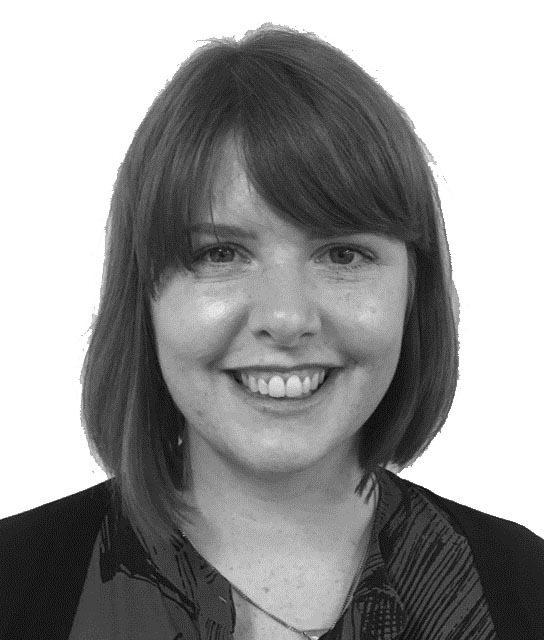 Over the past year the retail sector has struggled to combat problems arising from ferocious online competition and increased business costs. However, in the face of this, the public clearly retains an affection for traditional high street brands with long and rich histories, such as John Lewis and Marks and Spencer. Similarly, while the BBC has faced challenging headlines over the past 12 month. But the public clearly still rates what the corporation offers and iPlayer and BBC One continue to be in strong brand health. 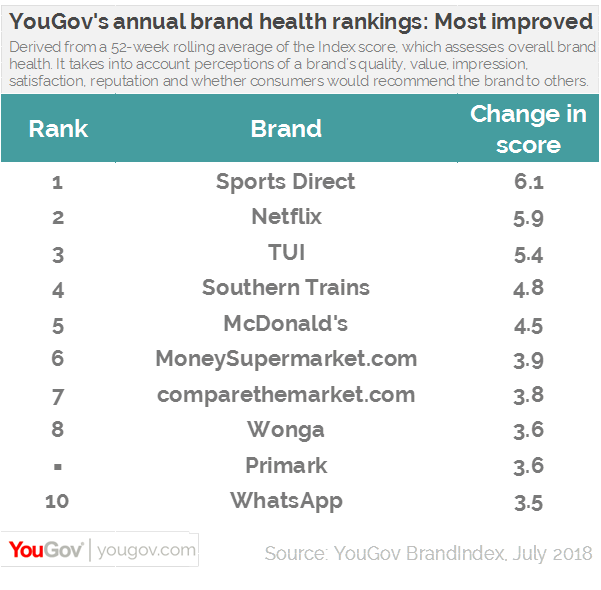 YouGov’s annual analysis also where the biggest increases in brand health have come in the past year. For several brands, escaping negative press coverage has seen an improvement in their scores, although many of them still remain in negative territory. For example, Sports Direct, the most improved brand this year, has seen its score improve by +6.2 points, moving from -12.4 to -6.2. While in past years it has often garnered negative press, it has enjoyed a period out of the headlines and its Index score has now returned to mid-2016 levels. Similarly, Southern Trains – for a long time blighted by strikes, cancellations, and ensuing adverse media coverage – has seen its score change from -16.1 last year to -11.3 now, an improvement of +4.8 points. Value fashion chain Primark has made a notable leap in the past year – going from having negative brand health to positive. Its Index score improved from -0.9 to +2.7 in the last 12 months, an improvement of +3.6. Elsewhere, Netflix continues to advance, with its score improving by +5.9 points (going from 19.5 to 25.4). Tech firm WhatsApp has seen its score increase by +3.5 – up from 18.9 to 22.4.